Becoming a makeup artist takes skill and talent—find out if you have what it takes to be successful in the makeup industry! Find out the 8 sure-fire signs that you’re meant to become a makeup artist! Download QC Makeup Academy’s free e-book and learn if you’re destined to start a career in makeup artistry. Download your free E-book and learn how you can start your makeup artist career! Find answers to your most pressing questions about the makeup industry! Download all the information you need to decide on a career in makeup artistry. Find out what it takes to become a makeup artist! Is a career in professional makeup artistry right for me? Do I have what it takes to make it as a makeup artist? What are the key traits all successful makeup artists share? What professional training do I need to become a makeup artist? How can I make the career change to be a makeup artist? And learn about the job description of a makeup artist! 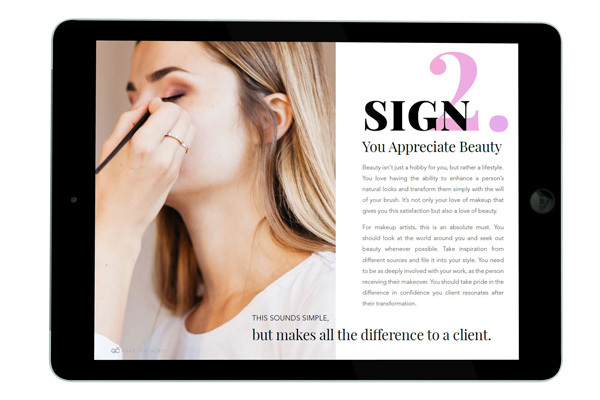 QC’s free e-book shows you what it takes to become a successful makeup artist, and tells you how to get started! Learn about each online makeup artist course and be on your way to a career in the makeup industry in no time! 5 personality traits of makeup artists, including a fantastic eye for color and the ability to work in a fast-paced environment. How makeup training will help you succeed—from flexible training to hands-on assignments, you’ll find out how QC’s makeup artistry courses get you started in the beauty industry. 4 reasons why a career in makeup artistry suits your lifestyle as an energetic, social, and determined person! You’ll be traveling and meeting new people in the exciting makeup industry! out on your friends. You always jump at the chance to try a new style, or even to create your own"
Find out which career path you should take! View Student and Graduate features on QC Makeup Academy’s Beauty Buzz blog to see where your professional makeup artist certification can take you. Download QC’s Free Makeup Artistry E-Book!